We've seen the Top 70 cars of the Yeehaw It's Texas 24 Hours Of LeMons, but that was only one photograph of each car. Now it's time to really load-test the Gawker image server, by checking out all our shots of the participants' machines; just make the jump and you'll see a gallery for each vehicle that managed to get onto MSR's track, plus links to team websites, accounts from drivers, and more! Because the Gawker server hamsters explode into flames when they try to spin their little wheels fast enough to cope with one big Über Gallery, I've broken it up into three parts, each accessible by clicking the appropriate image below. Once you're done here, you might as well continue to torpedo your productivity by checking out past 24 Hours Of LeMons Über Galleries, including Detroit-ish '08, New England '08, South '08, San Francisco '08, Arse Freeze '07, and San Francisco '07. 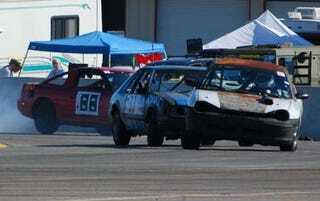 And now, arranged by car number, the Yeehaw It's Texas 24 Hours Of LeMons entrants. Thanks to all the team members who sent in photos; any team wanting the original full-resolution images I shot of their car, go ahead and email me with your request and I'll hook you up.